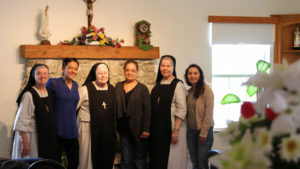 Single women are invited to join the Sisters in their life and work. We are the Benedictine Sisters for human life: respecting, praying, and working for the dignity of human life from natural conception to natural death! The Benedictine Sisters of Good Shepherd Monastery in Rio Grande City, TX, are inviting women to join them in a special apostolate. We are Benedictine Sisters addressing the major moral issues of our times. Plan for Marriage, Spousal Love, and Family. -Pope John Paul II, Familiaris Consortio #75. The 21st Century is a time to draw more abundantly upon the “Feminine Genius,” (Pope John Paul’s term) which is the woman’s gift for promoting the integral completion of the person. We do this by addressing the grave damage brought about by the rejection of the values of Humanae Vitae, and by encouraging a return to these values. We promote the teachings of Humanae Vitae (Human Life), Donum Vitae (The Gift of Life), Evangelium Vitae (The Gospel of Life), Familiaris Consortio (The Role of the Christian Family in the Modern World), and the Theology of the Body. These are the articulations of God’s wonderful plan. Promoting God’s plan includes Natural Family Planning and living a chaste life. This also includes exposing the many facets of the culture of death. Major obstacles to God’s plan for marriage, spousal love, and family are massive: contraception, sterilization, and abortion. 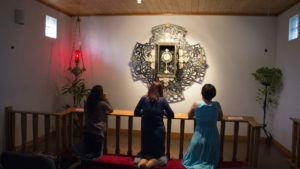 We do this by addressing a wide range of audiences: retreat groups, parish groups, youth groups, married couples, pastoral workers, Catholic radio and newspaper interviews. We motivate many people to participate in this special apostolate. Experts with special expertise, as needed. If you discern that God is calling you to the religious life, where you can pursue a closer relationship with God in community prayer, and then apply your talents and energies to shaping the culture by making God’s plan better known to a wide range of audiences, then contact us.